Waleed Khaliqi (ولید خالقی) is an IT Technologist, Social Activist and blogger from Kabul, Afghanistan; who has been actively involved in community and capacity building of his Afghan fellows since 2012. He is the former President of National IT Professionals Association of Afghanistan (NITPAA), where he held charge during Oct 2016 – Jan 2019. Tenure, he was instrumental in making NITPAA an At-Large Structure of ICANN, and registering it with Afghan government as a formal non-for profit NGO. Waleed holds a Bachelor’s Degree in Computer Science, Majoring in Network and Telecommunication, from Kardan University. In addition, he has Diplomas in Information Technology, Business Administration, Accounting Management, and English Literature. He is a full time government employee, where he works as a Technical General Manager with Afghan Ministry of Information and Culture. Waleed remained inSIG 2016 and MEAC-SIG 2017 fellow and has participated in ICANN 57 in Hyderabad, ICANN 60 at Abi Dhabi and IGFA 2018 at Kabul. 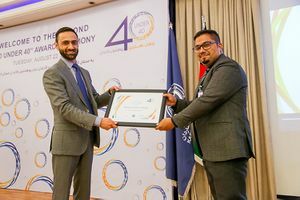 He is one of the Key Organizers of Afghanistan School of Internet Governance (AfSIG) which has been organized in 2017 and 2018 and will be practiced in 2019 as well. Waleed writes articles for media, and has skills in online/offline journalism and blogging. besides writing for his own blog (MyNetworkingLabs.Com), Waleed has also written for AfIG.af, NITPAA.org.af and Bakhtarnews.com.af. India School of Internet Governance; inSIG 2016 in Hyderabad, India. Middle East School on Internet Governance; MEAC-SIG 2017 in Ankara, Turkey. ICANN 57 Meeting in Hyderabad, India. ICANN 60 Meeting in Abu Dhabi, United Arab Emirates. Organizing School on Internet Governance - AfSIG a National Initiative, at MEAC-SIG in Ankara, Turkey. Seminar on Journalism in the digital age, at MoIC Kabul, Afghanistan. Internet Governance and the Digital Divide, at AfSIG 2017 in Kabul, Afghanistan. The Domain Name Concepts, at Salam University in Kabul, Afghanistan. The Right Usage of the Internet, at MoIC Kabul, Afghanistan. Internet Governance: Introduction, History and Principles, at AfSIG 2018 in Kabul, Afghanistan. Challenges in Afghanistan / An Under Developing Country Perspective, Panel member at Kardan University in Kabul, Afghanistan. Waleed was recognized as exceptional alumni of Kardan University who is under the age of 40 and thus won the “40 Under 40” Award in 2017. 2014 - Now - Waleed Works as a General Technical Manager with Afghan Ministry of Information and Culture (MoIC). 2012 - 2014 - Worked in different positions with different government and non government organizations including RANA Technologies as a Network Engineer, and Afghan Ministry of Information and Culture as a Sr. IT-Officer. National IT Professionals Association of Afghanistan (NITPAA) is a not-for-profit, membership-driven organization, that relies on volunteer collaboration of its members. The organization became part of At-Large Structure as an ALS under the APRALO region in 2017. and the NCUC organizational member in 2018. NITPAA is also organizer of AfSIG and organized the very first version of the School in year 2017. In Support of the community and Capacity building of his Afghan fellows, Waleed is also involved in the Computer Science Club of his University as an Alumni and is supporting the initiative along with Kardan leadership. Waleed represents NITPAA, as an ALs, in APRALO At-Large Structure. He has also participated in APRALO General Assembly in ICANN 60 Abu Dhabi United Arab Emirates. Waleed is also inSIG 2016 and MEAC-SIG 2017 Alumni. Waleed is interested in raising awareness about the IG related issues in between public. Thus he is one of the key organizers of Afghanistan School of Internet Governance organized in 2017 and 2018. Waleed has Organized many Internet related events in Kabul for the governmental employees and University and School students. He defended his bachelors degree by writing a thesis on IXP's and have created a technical sample project on how an IXP could be installed. Waleed holds a Bachelor’s Degree in Computer Science, Majoring in Network and Telecommunication, from Kardan University. In addition, he has Diplomas in Information Technology (DIT), Business Administration (DBA), Accounting (DIA), and English Literature (DEL). He is a Microsoft Certified Professional and has academic background in Cisco Tracks as well. This page was last edited on 20 January 2019, at 05:07.